What is the location this story was set in? What decade is the story set in? What was Johnny's parting gift to Ponyboy? The links here have been scrutinized for their grade and age appropriateness; however, contents of links on the World Wide Web change continuously. It is advisable that teachers review all links before introducing CyberGuides to students. The Outsiders is Francis Ford Coppola's screen adaption of S. E. Hinton's popular novel about troubled teenagers growing up in Tulsa, Oklahoma in the mid-sixties. The film revolves around the conflicts of the two groups in town, the "greasers", poor kids from dysfunctional families with limited prospects, and the "socs" (pronounced with a soft "C" as in society), affluent kids from the nice part of town who want to control things and keep the "greasers" in line. The story is told from the perspective of two young greasers, Ponyboy Curtis (C. Thomas Howell) and Johnny Cade (Ralph Macchio). As the film opens, you see them hanging out with Dallas Winston (Matt Dillon), who epitomizes the delinquent and anti-establishment attitudes of the greasers. At the local drive in, Johnny and Ponyboy accidentally hook up with Cherry (Diane Lane) and Marcia (Michelle Meyrink), two young soc girls who have left their dates because they have been drinking and are being abusive. Dallas tries to move in on the girls, but they tell him to get lost, and end up leaving the drive-in with Ponyboy and Johnny who they recognize from school. This brief liaison results in trouble later for the two boys, when a car full of socs track them down later in a park for "messing with their women." Outnumbered and overpowered by the socs, Ponyboy is grabbed, beaten, and dunked in a wading pond by them while Johnny is knocked down to the ground. But Johnny has a switchblade and stabs one of the socs which causes them to run away. When Ponyboy and Johnny recover from the struggle, they realize that the guy Johnny stabbed is dead, and that the authorities are going to be coming after them. Figuring that their only choice is to run away, they contact Dallas at a honky-tonk joint in town, and he tells them about an abandoned church in the next town where they can hide, and gives them some money. The boys are successful in finding the hideout, and prepare for a long stay. During this time, they change their appearance, spend time reading Gone With the Wind, and for the first time really reflect on their lives and things like the simple beauty of a sunrise. Dallas comes to check on them after a week, and they tell him that they no longer want to hide out, but instead go back and face the authorities. On the way back, they drive by an orphanage which is on fire and discover that a number of kids are trapped inside. Although Dallas warns them to stay away, Ponyboy jumps out of the car and runs to save the kids. Soon all three of them are behaving like heroes, saving many lives, until overcome by the smoke and falling debris. The remainder of the film shows how the boys come to grip with their futile situations, face down the "socs" in the inevitable rumble, and deal with the tragedies that life as a "greaser" entails. Chance plays a significant part in the genesis of many movies, but The Outsiders was surely the first to spring to life because a group of schoolchildren wanted it to happen. In the spring of 1980, a librarian at Lone Star Jr. High School in Fresno, California, took courage in hand and wrote to Francis Coppola. She told him that the students and faculty of her school wanted him to make a movie from a book they all loved very much, The Outsiders, by S. E. Hinton. The librarian, Jo Ellen Misakian, wasn't sure of the director's current address, so she sent the letter, along with a copy of the book and a petition signed by the youngsters, to the New York offices of Paramount Pictures. This was the studio that had produced two of Coppola's best-known films, The Godfather and its sequel. Missives such as this often get lost, but this one didn't. It was duly forwarded to Coppola's Zoetrope Studios in Los Angeles and, lo and behold, actually read. Not only read, but investigated by the director's long-time associate Fred Roos. Mr. Roos learned that the book was a bestseller in the field of adolescent literature and was taught in school systems throughout the country. It was dear to the hearts of thousands of school children, as well as their parents and teachers, but only the kids at Lone Star did something to see it transformed into another medium. Dalton, from Albequerque, New Mexico, and Michelle Meyrink of Vancouver, British Columbia, made their professional debuts, but all of the others were experienced: C. Thomas Howell, Ralph Macchio, Patrick Swayze, Rob Lowe, Emilio Estevez and Tom Cruise. 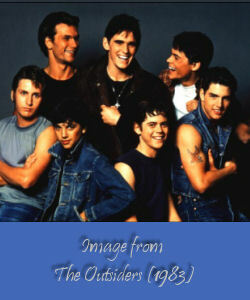 The Outsiders is proof that kids can make a difference. A copy of Jo Ellen Misakian's letter and petition to Francis Ford Coppola are attached.